Since the beginning of time, humans have felt the need to use the secular to express the divine. From shamanic cave paintings to the pagan Golden Calf of the Israelites, from the slabs of Stonehenge to the storytelling panes of Notre Dame Cathedral’s windows, from the calligraphic decorations in Islamic sacred art to the familiar rotund form of the Buddha, religious art has captured the imagination of people spanning time and geography. It’s been used for many purposes: to teach the masses, like the Biblical scenes designed to educate the illiterate in Michelangelo’s Sistine Chapel; as aids or props in worship, as in African tribal masks; as a means of propaganda or social commentary or in some cases, simply to capture the beauty of the divine, designed to evoke reverence and awe. Just across the Binh Trieu Bridge in Thu Duc lies the massive Fatima Binh Trieu Church. Named after the Statue of Our Lady Fatima which commemorates the appearance of the Virgin Mary to three shepherd children in Portugal in 1917, the red and rose-colored brick church has its own miraculous origin. 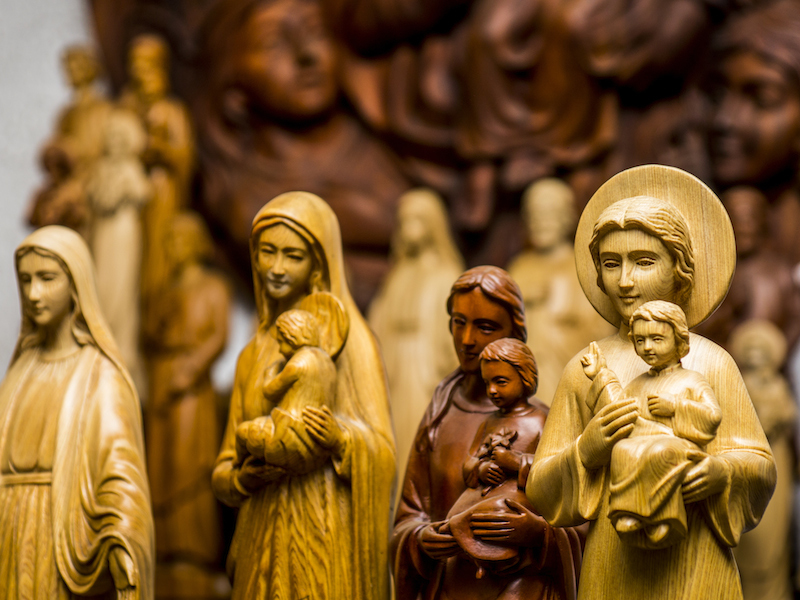 Legend has it that a replica of the Statue of Our Lady Fatima was on international tour, stopping in Vietnam in 1962. When the truck carrying the statue got to Binh Trieu, the motor died. Mechanics were summoned but after two hours could find nothing wrong with the truck. After a round of prayers, the engine miraculously started again, which was taken as a sign that the Virgin Mary wanted a holy site built in the then undeveloped area. The church (which is currently being renovated with projected completion in two to three years) houses a three meter tall replica of the Statue of Our Lady Fatima and serves a Catholic community about 5,300 strong in the surrounding area, and attracts thousands more pilgrims annually. The road that leads to the church is lined with shops selling religious paraphernalia of all kinds, including Thien An Art. 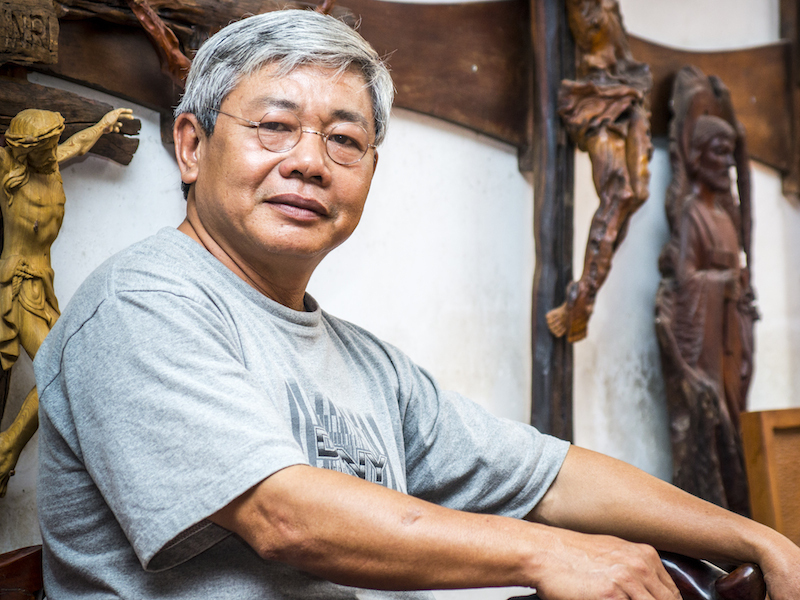 Founded by Nguyen Thanh Lam in 1999, Thien An Art makes Catholic devotional art for galleries, churches, organizations and private homes both in Vietnam and abroad. 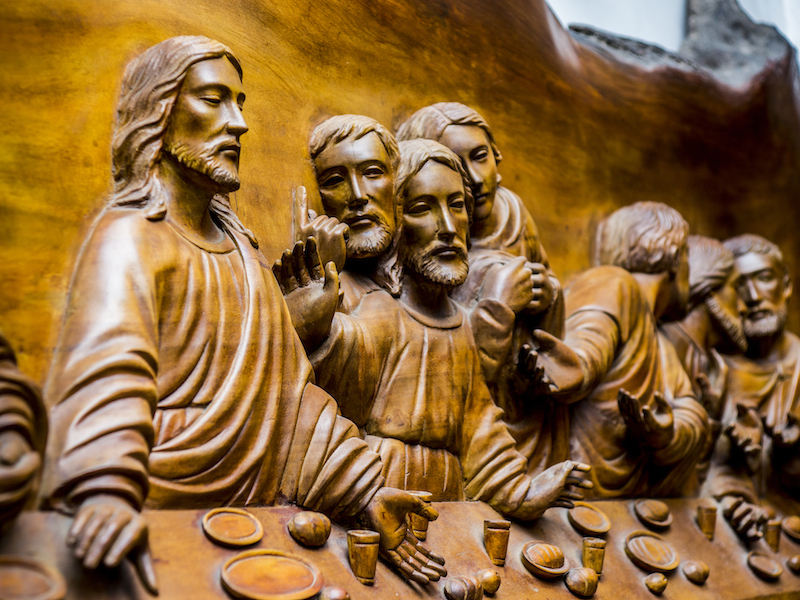 The showroom is filled with wooden sculptures of Jesus, Mary and various saints, many seemingly emerging from the wood, left in its natural state.